Nurturing a rich cultural and traditional heritage, the city of Bangalore has many historic and magnificent temples that are worth a visit. Visit the age-old & historic temples around the city. Discover the historic aspect & mysteries of the temple. Witness the biggest bull temple in the world which is meant for Nandi. Bengaluru, mostly known for being the IT hub in Karnataka, is a city which has transformed from being very traditional to what it is now, a complete cosmopolitan! Nurturing a rich cultural and traditional heritage, the city has a plethora of options to see and savour. While most travellers talk about the nightlife, food and fun that this vibrant city offers, little do we know about its past and its forgotten landmarks. Mostly a Hindu-rich city in the past, Bengaluru has many historic and magnificent temples that are worth a visit. The driver will pick up the guests from the hotel/residence/others as per the address provided during booking. 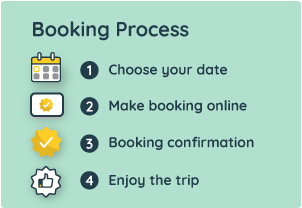 The pick-up time for the tour is selected by the guests during booking. ISKCON temple: The temple was built in the 17th century A.D. by Venkoji, the brother of the Maratha King Shivaji in a Dravidian style of architecture. This is one of the largest ISKCON temples in the world. Mahalakshmi & Anjaneya temple: Sri Prasanna Veera Anjaneya Swamy Temple is located in Mahalakshmi Puram, Bangalore. The main temple is 40feet long and 40feet wide and in the middle is the abode of the Prasanna Veeranjaneya Swamy. The Lord Prasanna Veeranjaneya Swamy has taken shape of a beautiful sculpture a colossal height of 22feet,16feet wide and 4feet thick in a Gigantic Rock. Kadu Malleshwara temple: 7th-century A.D. Hindu temple dedicated to the Shiva located in the Malleshwaram locality of Bangalore. The temple was built in the 17th century A.D. by Venkoji, the brother of Maratha King Shivaji in the Dravidian style of architecture. Nandi/ Bull temple: The bull referred to is a sacred Hindu demi-god, known as Nandi; Nandi is a close devotee and attendant of Shiva. Bull temple in Basavanagudi is said to be the biggest temple to Nandi in the world. Gavigangadhareshwara temple: also Gavipuram Cave Temple, an example of Indian rock-cut architecture, is located in Bangalore. The temple is famous for its mysterious stone discs in the forecourt and the exact planning allowing the sun to shine on the shrine in a certain time of the year. It was built in the 16th-century by Kempe Gowda the founder of the city. At the end of the tour, the guests would be dropped pick to their hotel/residence/other address.